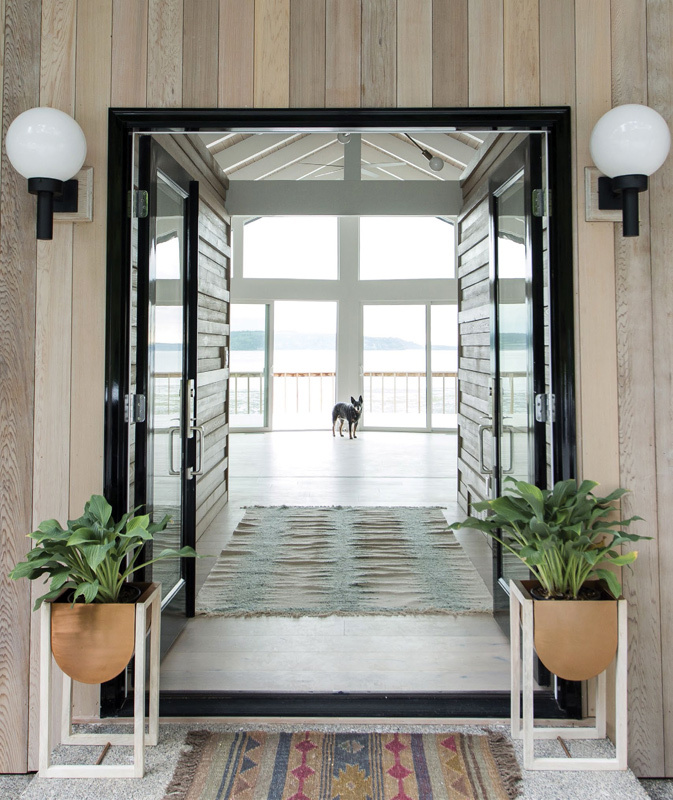 You won’t find seashells and nautical knickknacks in this modern marvel on Washington state’s Puget Sound. Yes, he did. But Jeff Elliott, who’d lived in Woodland before moving to the Pacific Northwest, had worked with Jaworski before and had a level of comfort with her. For her part, Jaworski was thrilled to take on the job. “Midcentury modern is my jam,” she says. The house, perched on a cliff at the end of a one-lane road, overlooks the ocean and sits next to a forest. Dark and dated, it needed a heavy dose of lightening up. And a poor layout required reworking to take maximum advantage of the home’s stunning views. The house did, however, have one stellar feature: a walk-in entry that opens up onto a great room with a wall of windows and glass doors. 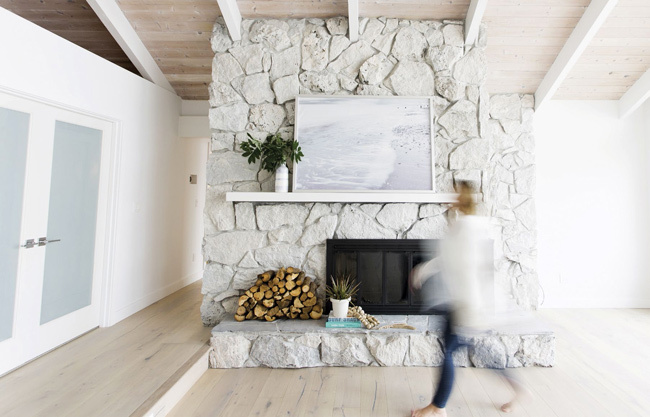 To give the house a relaxed, beachy feel, Jaworski whitewashed the wood-planked ceiling, beams and rock fireplace and chose washed-out hardwood for the floors. 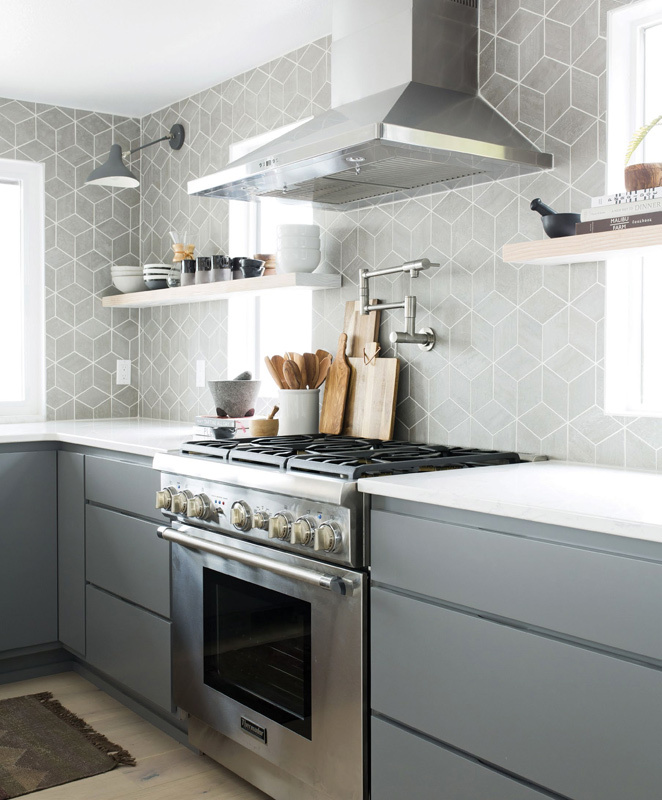 Flat-panel cabinets painted gray and white quartz countertops are easy to care for and add to the home’s casual, beachy aesthetic. Reconfiguring the layout, Jaworski flip-flopped the kitchen and dining room, so that someone standing at the sink could look out onto the sea. The kitchen doubled in size, while the formal dining room was downscaled to a nook with a banquette. (Who needs a formal dining room at the beach?) 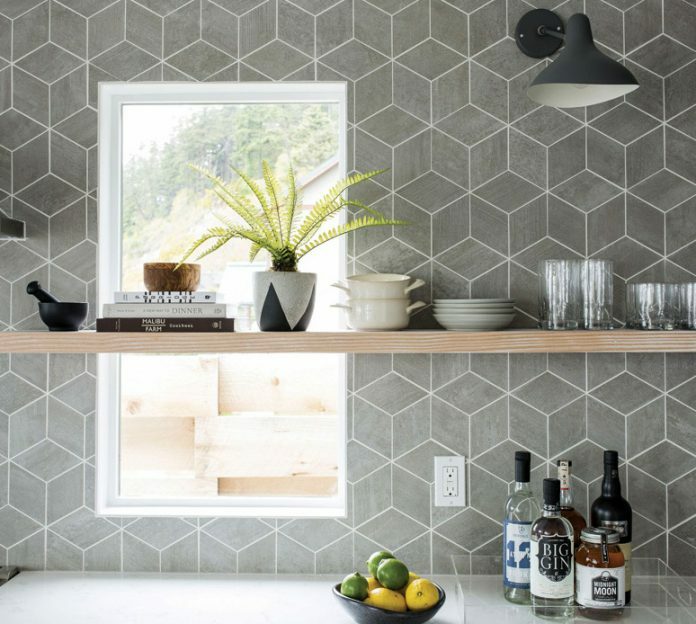 Jazzy geometric tile for the backsplash served as kitchen inspo. Jaworski loved the tile so much, she ran it all the way up to the ceiling. The entry opens up to the great room. In the great room, the designer whitewashed the rock fireplace to lighten and brighten things up. 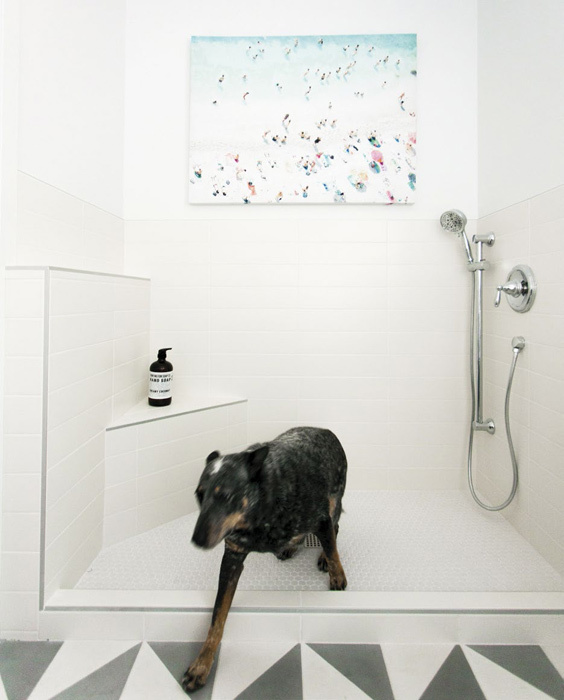 In the laundry room, a foot shower for rinsing off sand doubles as a doggy bath.